These Tumblers and Drinkware were created in Detroit. They used the power of air to create a permanently sealed and insulated cup to help keep your cold drinks cold and your hot drinks hot. The two engineers who came up with the first tumbler used the last letters of their last names, Cotter and Davis, to come up with the name TERVIS. Every Tumbler is an expressive and fun design. You’ll love the options. 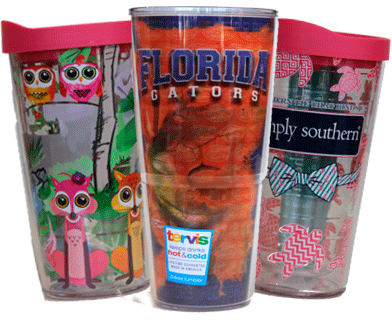 Support your favorite college teams with our Florida Gators and UCF Tumblers. Show off your colors with fun and exciting designs. Pick the tumbler that suits your personality and mood. We love the cheery Hallmark Sunflower design, the Simply Southern Tumbler and letting our soccer flag fly for Orlando City!